The next session starts on October 9th at 7pm and we have room for you! There comes a time in everyone’s life when they realize they don’t know how to cook. Whether the epiphany strikes in middle school or mid-midlife crisis varies from person to person, but the solution remains the same: It’s time to learn! And it’s not as impossible as it might seem –even if you’re intimidated by cooking spaghetti. 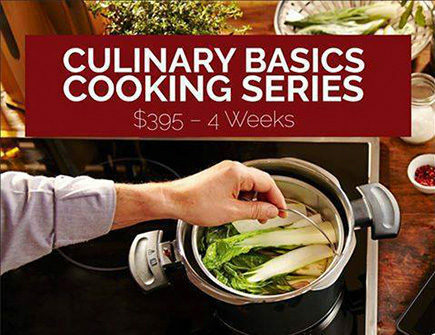 Chef Eric’s 4-Week Culinary Basics Series is especially crafted for beginners, and take it from graduate Alan Weil: “Anyone interested in learning to cook will come out of this series much more confident about his or her cooking skills.” Chef Eric will make sure of it! So what’ll we cover? Lots of meals that YOU learn to make and we eat them at the end of each Class! Week 1: Knife skills. Proper technique is the foundation of proper cooking, and we make sure you’ve got it down. We’ll go over how to hold, use, clean and sharpen a knife before you start slicing and dicing. Then you prepare some simple meals like Latin-Style Strip Loin Steak with Chayote Squash, Risotto-Style Orzo Pasta with Parmesan Cheese and Spiced Peruvian Chickpea Cakes. Week 2: Meal prep. We’ll build off what we learned in the first class and start playing with international recipes like Spice Rubbed Skirt Steak, Thai-Style Noodle Salad with Asian Five-Spice Chicken Skewers and Spicy Peanut Sauce, Italian Chicken, traditional Meatloaf, and Lemon Orzo Pasta with Kalamata Olives. And yes – taste-testing is encouraged! Week 3: Homemade pastas and potatoes. By now, you’ll be ready to tackle the art of pasta-making. Trust us; it’s far better fresh! We’ll learn how to make it, cut it, cook it and pair it with splendid sauces like Bolognese, Herb and Cheese Spaetzle, and creamy Alfredo. We make a killer Potatoes au gratin, too! Week 4: Seafood. With a focus on safety and sanitation, we’ll prepare fantastic fish dishes like Seared and Spice-Crusted Ahi Tuna, Grilled Chipotle-Spiced Shrimp and Sole Vin Blanc with Ginger-Lime-Scallion Butter – all of which are sure to blow your friends and family away at the next dinner party you’ll be hosting, armed with your newfound knowledge. Don’t let takeout take over your life. To quote the great Julia Child, “The only real stumbling block is fear of failure. In cooking you’ve got to have a what-the-hell attitude!” So don’t be afraid to learn to cook; Chef Eric will be there every step of the way. You ARE capable of cooking!